Hong Kong, 2001 Cor – 94 min. 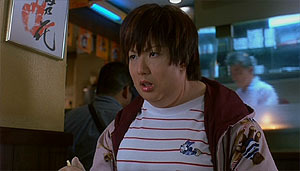 Mini (Cheng) is a fat immigrant from Hong Kong living in Japan. During a piano recital by young star Kurokawa she leaves the room in tears. 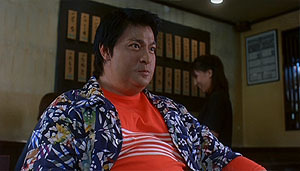 The owner of a boarding house tries to marry her to some of her guests and finally introduces her to knive seller “Fatso” (Lau), also from Hong Kong and, as his nickname indicates, another XXL citizen (1). He helps his compatriot to evade her debts and when finding out about the history of depression that led her to eat until she was 300 pounds he decides to help her regain shape in a record time, before a new rendezvous with Kurokawa. Johnnie To and Wai Ka-fai bring Sammi Cheng and Andy Lau together again after the romantic comedy Needing You (2000). 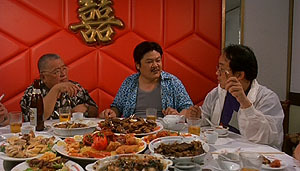 The recipe seems to work — the actors turn out to be half way through to box office hits in Hong Kong —, so it would be used again in Yesterday Once More (2004), directed by To alone, without the use of excessive make-up. 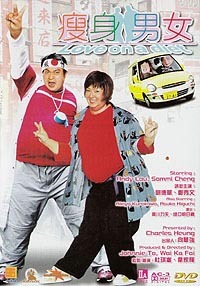 As we have already mentioned in other reviews of To's work (probably the director with most entries on the Portuguese version of the site), the production company he created by the time Hong Kong reverted back to China — Milkyway Image — voted itself in the beginning to the production of noir and personal films with a limited budget imposed by the film industry crisis. After a few years, light comedies turned up, allowing the studio to survive and stimulating the creation of more mature works — those that usually are shown at the most renowned film festivals. Mini (Sammi Cheng) explains to Fatso (Andy Lau) that she gained 200 pounds after she and her boyfriend went separate ways. Love on a Diet falls under that category of films intended to be light and with broad commercial appeal. The script is very simple and without bringing any surprises, supported on its stars and on a sucession of gags related to their overweight. Watching superstars Lau and Cheng in rubber “suits” that totally change them turned out to be a great audience attraction factor. Without much sophistication, one can only try to enjoy this film as mere entertainment. The humour sometimes works fine and its structure, although quite predictable, allows for a rather agreeable visioning. Watching it a second time was, however, quite painful. While Fatso delights himself around dinner, Mimi is on a diet. The jokes are based on the protagonists' excess weight and on Mini's attempts to loose a lot, taking advice from several people — including pills that cause diarrhoea and swallowing a worm that devours any exceeding food inside her. More conventional methods are also an option, such as a rather convenient product placement for a Japanese health club. Since this is a Hong-Kong film, one should expect it to be less concerned about political correctness than a English spoken work of its kind. Here jokes about overweight people are unapologetic (they devour food as if it were the end of the world, without taking any etiquette rules into consideration) and the thin, slim silhouettes are pointed out as a goal to be achieved. More, the relationship between Cheng and Kurokawa is deemed impossible to come true as long as she remains fat. An argument about efficient diets, before a well replete table. Two actors usual in To's films, Wong Tin-lam and Lam Suet, give their contributions (on the left). Meanwhile, Mini keeps a heavy foot and her depressive tendencies. The PC version would probably end up with some kind of reference about the importance of accepting people as they are, instead of valuing the slim well-dressed ones simply because they are like that. In fact, if one can critic its “morality” it is because of the crude association between being thin (beauty), elegant and educated, in opposition to being fat, sloppy, spitting food and having greasy hands. As for me, I can do without the “morality” as long as the humour works out well, served preferably in generous quantities. It's not the case here. (1) Fei Lou 肥佬 (or Feilao, in pinyin) with a similar meaning to that of the English subtitles, “fat person”. DVD (China Star, R0). Dolby 5.1, anamorphic (the cover displays a letterbox logo). Video extras: making of (21'43), trailer, text on the characters and notes about the directors. The option to choose between a Chinese or English language menu is available when inserting the disk. The making of displays onscreen subtitles (non-removable) both in Chinese and English.